The United Nations Declaration on the Rights of Indigenous Peoples sets out minimum standards for the “survival, dignity and well-being” of Indigenous peoples around the world. The Declaration builds on existing human rights standards, many of which represent established, legally-binding obligations of states, and applies these standards to the specific needs and circumstances of Indigenous peoples. 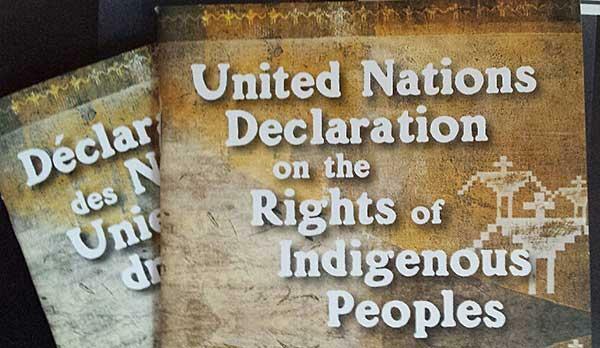 The Declaration provides guidance to governments, a roadmap for non-Indigenous peoples to better understand the rights of Indigenous peoples, and a powerful tool to advocate for the rights of Indigenous peoples before courts and tribunals. The United Nations adopted the Declaration on September 13, 2007, after more than two decades of negotiations and deliberations in which Indigenous peoples from around the world participated as experts on their own rights. The triumph of the Declaration's adoption was marred only by the actions of four prominent and wealthy Western states, Australia, New Zealand, the United States and Canada, which cast the only votes against the Declaration. Today, all four of these states have reversed their positions and officially endorsed the UN Declaration. In itself, this dramatic turn-around is testimony to power of public mobilizing for human rights. But more than that, the official consensus that now exists in support of the Declaration can only strengthen the hands of human rights defenders in demanding that governments make good on their solemn commitment to uphold its principles and provisions. Today, courts in Canada and around the world the world are beginning to use the Declaration to interpret national laws. And human rights bodies from provincial commissions to the expert bodies of the United Nations are using the Declaration to interpret state obligations. Key provisions of the Declaration -- such as the right of Indigenous peoples to say no to unwanted development on their lands -- are even being adopted by some investors, corporations and international lending agencies. It is vitally important that these minimum standards -- so urgently needed by some of the world's most impoverished and marginalized peoples – be fully implemented, without discrimination and without further delay. Amnesty International works to promote the UN Declaration through a coalition of Indigenous peoples' organizations and human rights groups, the Coalition for the Human Rights of Indigenous Peoples.